In case you were wondering whether Greg Gianforte will ever live down his body slam of a reporter for the Guardian, here’s a clue. The Associated Press reported last week that Gianforte drew boos from the Republican side of the aisle during his brief speech following his swearing in as Montana’s representative in the U.S. House. The murmurs apparently had nothing to do with misdemeanor assault but came in response to Gianforte’s call to “drain the swamp” and for a bill denying pay to members of Congress if they fail to balance the budget. 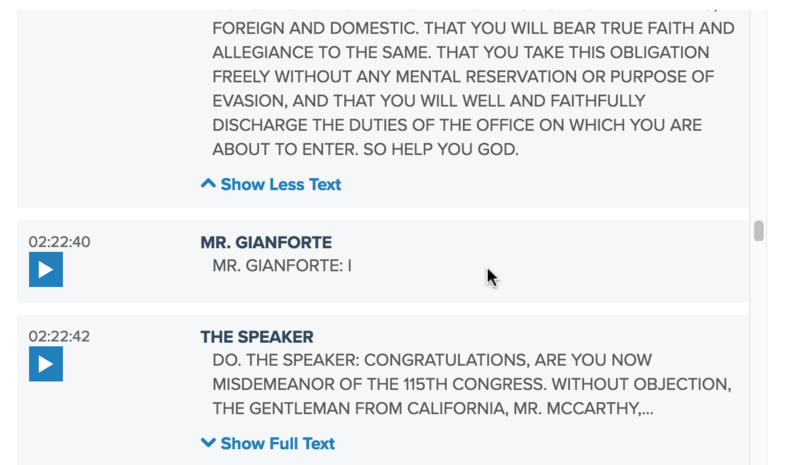 But what’s really interesting is the C-SPAN transcript of Gianforte’s swearing in. The transcripts, according to a FAQ at the C-SPAN website, are drawn from the closed captioning that scrolls on the screen during sessions of Congress. The transcripts are included on the website to help visitors find the video they want, not to provide an accurate record of the actual speeches. Putting the "forte" in Gianforte since 2017! The audio clearly does not say 'misdemeanor', and I can't imagine how an automated system could come up with it there. Presumably a (bad) joke inserted by a person. I admit I cringed when I heard Ryan pronounce 'discharge' with first-syllable stress. That shows a lack of respect for the oath, intentional or not. How does a difference in the stress of a word show a lack of respect? I could imagine this occurring as a a disfluency, a personal quirk, an educational gap, or a regional accent, but my imagination fails to create the "lack of respect" scenario. It's not an automated system, but automation is still involved with it to an extent. Closed captioners – all humans, as of yet – use a system with a lot of autocompletion macros, typing short words that get automatically expanded to long words, in order to keep up with what's being spoken. A typo in one of those is likely to have resulted in "misdemeanour" instead of "member". How does it show lack of respect? Clearly, Ryan "dis-sed" him! On last night's PBS Newshour, which seemed to have a new captioning crew, "Donald Trump" became "documented trouble." I thought assault was a felony.